Abstract: Despite the publication of hundreds upon thousands of photographs in the press, most analyses of photojournalism focus on iconic photographs and iconic images in photography. This chapter aims to highlight how such news icons have lost their status as transparent conveyors of information to take on that of upgraded graphic forms, produced by a self-fulfilling institutionalization process. Iconic images comprise a small group of images that are chosen by the profession of photojournalism and are representative of the narrative stereotypes created by the media industry. They are the most obvious manifestation of the hierarchical organization of information, based on semiotic criteria, of which photography has been an important component since the beginning of the twentieth century. Photographic “icons” provide the proof of and illustrate narrative visual practices in news media, an idea largely ignored by the profession, or uncritically accepted by it as a “magic” encounter between the objective and the aesthetic. Citation: André Gunthert, « Visual journalism, or the hidden narration », in Thierry Gervais (dir. ), The Public Life of Photographs, Toronto, Ryerson mage Center Books, 2016, p. 154-171. «Sacred images for a secular society1» or icons of photojournalism, according to the communication researchers Robert Hariman and John Louis Lucaites, are emblems that impose themselves on the spirit of the time. The culmination of a tradition that remembers only the most glorious successes of press photography, their book No Caption Needed confirms the view that the media image is a new history painting – but a spontaneous, paradoxical, miraculous painting. How can photography, which in theory falls under the category of documentary recording, produce these allegories worthy of the graphic arts? The very rarity of these successes seems to confirm the exceptional nature of the meeting «of the significance of an event, and (…) a precise organization of forms2», in the famous words of Henri Cartier-Bresson, designated by the historian of photography Vincent Lavoie as a «definition in principle of the press image3». But one could describe it otherwise. The Agence francaise de presse (AFP) sends out more than 2000 photographs a day. Such a quantity suggests the difficulty of any systematic analysis. The combination of this constraint with the still limited development of visual studies explains why there is, so far, no all-embracing description of iconographic practices in the news press, a subject that has been relatively unexplored. An approach such as the one by Hariman and Lucaites has a major defect: it validates a hierarchy imposed by the journalistic profession while erasing the very existence of that selection. Not one of the images forming the framework of the visual analyses of photojournalism has failed to be the object of a process of distinction by its protagonists, in particular by means of international awards as the Pulitzer (from 1942) and the World Press Photo of the Year (from 1955). The mystery of their exceptional popularity and their ability to be appropriated seems less opaque if we remember that they have been selected, reproduced, or commented on repeatedly, themselves becoming fully fledged mediatic objects subject to reiterated exhibition, which leads to fame. Redoubled images, these iconic photographs lose their status as transparent conveyors of information to take on that of upgraded graphic forms, produced by a self-fulfilling institutionalization process. When Juliette Hanrot wants to persuade us that the “Madonna of Bentalha” by Hocine Zaourar, winner of the 1997 World Press Photo award, is composed like a painting, she overlays the photograph with the pictorial references and formal analytical tools taught in art schools: the harmonic square, the spread of light, the golden section4. «This symbolism of color, light and clothing, gives the Madonna of Bentalha an interpretative depth unusual for a photograph», she opines, without perceiving that it is precisely that interpretative effort that endows the image with extra layers of meaning. Would this critical interpretation have seemed legitimate for a photograph of any sort of accident? Would a publisher have devoted a book to illustrating an ordinary event, even if it was endowed with exceptional aesthetic qualities? The attention attracted by this news photograph, further prolonged by Hanrot’s book, derived from a mediatic mechanism motivated primarily by the emotion aroused by the event in question. Diagrams by Juliette Hanrot, La Madone de Bentalha, 2012. It is the importance given to one of the bloodiest massacres of the Algerian Civil War that explains the value assumed by this photograph. It was cropped and given priority distribution to its customers by the AFP, then selected to illustrate their lead story by about 750 daily newspapers on September 24 and 25, 1997. This exceptional exposure in turn became the subject of reflective comments by specialist journalists, confirming that it stood out from the daily flood of news images and had achieved the status of an icon. 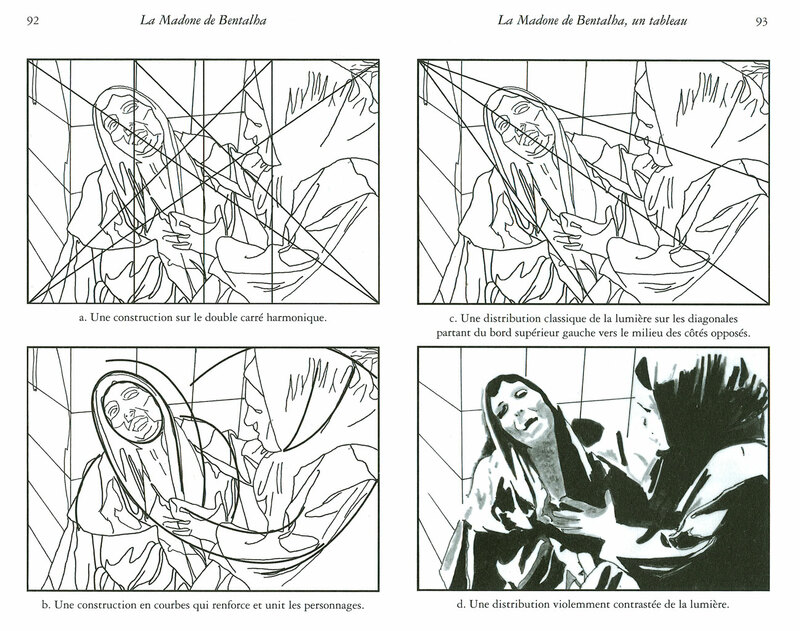 Michel Guerrin was the first writer to compare the image of the weeping woman to a Pietà and to title it “Madonna5”, opening the way for a long series of interpretative misunderstandings. The authority of Le Monde’s photography expert allows to sweep aside the incongruous aspects of this description in the context of a civil war in a Muslim region. That association is neither the doing of the woman in the photograph (who will sue for libel for being so described), nor that of the Algerian photographer, who «finds it hard to understand the impact of the document6». The reference to Christian iconography can only be explained by an over-interpretation on the part of Western editors, who were motivated by the customary mediatic reaction of resorting to a symbolic image to illustrate tragedy. 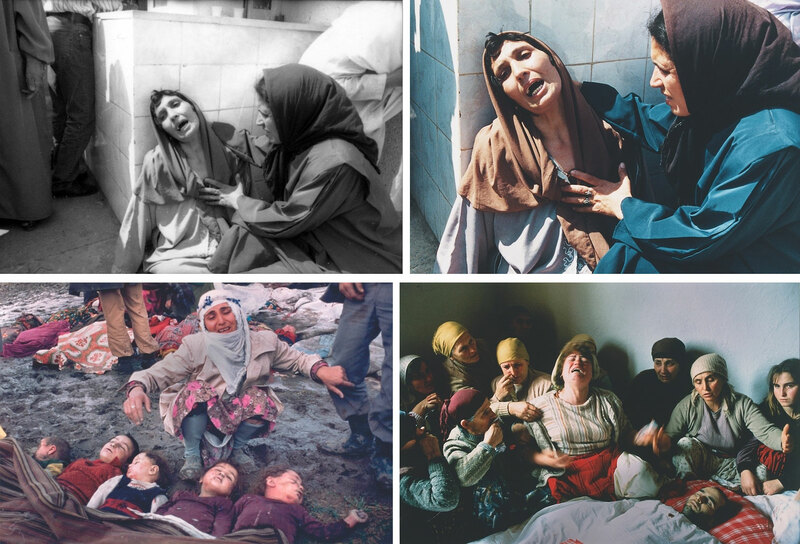 Compared with other, related images also honored by World Press awards, such as the photograph of mourning for a young Kosovar by Georges Mérillon (1990), Hocine Zaourar’s photograph is special in that it does not show dead bodies. It may be thought that it was selected for its allegorical, conventional, and inoffensive nature, corrected by a cropping that decontextualizes it, and given a inappropriate caption by those who must be called its actual authors: the picture editors, who were responsible for all the choices that have determined the visibility and understanding of the image. In the mediatic structure, the visibility of a photograph depends solely on the place assigned to it by the news hierarchy. As a system for selection and amplification of news stories, and to avoid producing only noise, the media apparatus has to organize these operations within the competitive context that shapes its ecology. The imperative of hierarchizing news stories results logically from that constraint. Intended for consumption by a wide public in a leisure context, mediatic products can rely only on elementary semiotic principles, the simplicity of which guarantees appropriation. Among the tools making it possible to organize the hierarchical arrangement of news stories, the most powerful principle is the variation of scale. In mediatic space, an indication by means of scale is associated with all published content; it is part of its editorial treatment and determines its placement in the publication. The importance of a news item is measured first in terms of space – the surface area accorded to it – and position (or its equivalent, timing, in streamed media). A news item that is larger in size is more important than a smaller one. Size is an indicator of a relative and contextual nature; its interpretation is based on progressive assimilation of an evolving set of editorial codes. Many other factors, such as variation of reiteration, the fame of the author, or assignment of a correspondent, complement that attribution of value based on scale, or scalar value. 3. Frontpage of the New York Times , 1912. The image is not only part of the content that is subject to this rule, but in itself constitutes an indication of scale likely to add value to the content. The presence or absence of iconography, its size and its quality are all factors that contribute to signifying and naturalizing the relative importance of a news story. Like the dimensions of the headline, the format of the photograph of the Titanic, published across five columns in the lead story of The New York Times of April 16, 1912, serves to demonstrate the significance attributed by the daily newspaper to the shipwreck of the liner. Life’s decision in 1966 to use coloured images to illustrate Churchill’s funeral is likewise a clear way of emphasizing the importance of the event, at a time when that treatment was still exceptional7. The interpretation of an image in a mediatic context depends principally on its scalar value. Robert Doisneau’s Le Baiser de l’Hôtel de Ville, which since its republication as a poster in 1986 has become one of the most famous photographs in the world, was first published in a smaller format in 1950 in the “Speaking of Pictures” column in Life. Of the six illustrations in the article, this image was one of those for which the smallest format was chosen. Given its low scalar value, at the time it was the subject of neither commentary nor reappropriation. Whatever its formal qualities, its modest size, which suggested lesser importance, could neither arouse attention nor legitimate any profound reading of it. Doisneau, « Le Baiser », first publication, Life, 1950. Poster, 1986. It is absurd to attempt to analyze a press photograph with the tools of pictorial formalism. The mediatic setting imposes autonomous rules that profoundly modify its perception. Photojournalism prices do not distinguish between images on the basis of formal criteria; they are awarded because of the exemplary way in which they convey events of high media value in visual terms. The scalar value of a photograph – defined by the editor and not by the photographer – is the prime motive in the interpretative process. When she thinks she is describing the aesthetic qualities of Hocine Zaourar’s photograph, Juliette Hanrot is actually demonstrating the enhancing mediatic effects that have turned it into an icon. In a world that is moving away from the Catholic tradition in great strides, it is strange that commentators on photographic icons do not ask questions about the paradox represented by the references to Pietàs, Madonnas and other benchmarks of a scholarly culture, which it is doubtful the audience addressed by the generalist press can recognize. Rather than by being due to the secret influence of mysterious survivance, these mentions can be explained more simply by the imprint of an education common to all media protagonists in leading positions in the visual field. They have learnt to accord legitimacy and value only to expressivity that can be justified by reference to masterpieces of painting8. Campaign « Lest we perish », 1917. Campaign « Lest we perish », 1918. The reading that associates women’s grief with the mourning of the mother of Christ is compromised by a variety of errors in interpretation. It shows a lack of awareness that Marian iconography is itself linked to an ancient tradition of female mourners. Above all, it fails to recognize that the introduction of this motif in the mediatic world was an invention of postwar humanitarian imagery – a context that uses the figure only for non-Western victims and has embarrassing paternalistic connotations9. Resorting to that interpretation is indicative of the problems raised by the narrative uses of photography. The subset defined under the term “icons” is typified by a powerful expressivity of the visual message. That characteristic contradicts the dogma of factual objectivity that is theoretically associated with the use of photography in the press. That a photograph has been selected for its expressive properties is anything but obvious in a practice that lays claim to documentary neutrality. This is why narrative uses of recorded images, which fits more naturally into other contexts such as advertising, have always been the subject of convoluted justifications. The development of “pictorial journalism”, popularized by the magazine Life since 1936 and thought to typify the magazine format, is invariably explained by competition from new media such as cinema, radio and television10. Edward Steichen at The Family of Man, 1955, MoMA Archives, New York. Resorting to the notion of the icon to designate its photojournalistic output is another way of neutralizing the paradox of the narrative image. Emphasizing the exceptional nature of these masterpieces, their characterization by using pictorial references distances them from the spectrum of advertising, substituting justification through fine art and high culture. Within the visual field, an insuperable gulf theoretically separates narrative use from documentary objectivity. The former belongs to the genre of illustration, while the latter is linked with the authenticity of recording. Not that photography cannot be used for expressive purposes, but that expressive use is deemed to remove from the photographic document the evidentiary properties that make it useful for news journalism. Illustrative photography and documentary photography are thought to fall into two symmetrical but antagonistic universes. The first is the business of the graphic designer and implies a prior commission; the second is the photographer’s business and assumes subsequent publication. The first falls under the purview of communication and allows retouching, mounting, and all forms of editing of the image, which is only the medium for a message. The second produces an authentic document that carries objective information, and implies the rejection of any manipulation13. But the reality of visual practices reveals a more complex and fluid area where the news photograph may very well have recourse to the resources of expressivity. The magazine format, usually identified with the popular weeklies of the 1930s, obviously benefited from the contemporary upsurge in visual communication and the vitality of advertising forms, but the porosity of the fields is older; it was being experimented with from the end of the 19th century14. One space in particular constitutes the laboratory for that dialogue: magazine covers or newspaper front pages, which are inspired by the model of the poster to offer a self-promoting description of the contents of the publication. The iconographic component quite naturally favours pulling power and suggestion. The range of expressive uses of the photographic image covers a wide spectrum in which we can specifically identify the use of the sensationalist snapshot, a form prized by the popular press from the 1930s to the 1970s15; the illustrative composition based on the creation of a link between text and image and the selection of iconography to suit a narrative intention; or more recently the symbolic or allegorical form, typical of the iconic photographic genre,has gained considerable prominence in the audiovisual media16. These various ways of making images speak, which can be combined, are characteristically the object of strategies of denial or containment by professionals. Journalistic mythology describes as a neutral and objective presentation what is fundamentally an exercise in qualifying information. Like the choice of a title or introductory paragraph, iconography plays a crucial part in this job of steering interpretation. But visual forms entail a greater margin of ambiguity than linguistic utterances (Roland Barthes suggested defining the photograph as a «message without a code17»). For that reason, a large number of expressive uses of the image deploy an implicit dimension, a rhetorical device as powerful as it is inadmissible in the news context. On January 21, 2012, during a journey to French Guiana, Nicolas Sarkozy, who at the time was campaigning for re-election as President, summoned journalists to an informal briefing, in the course of which he for the first time mentioned the possibility of defeat. To accompany that news item, Le Monde, Libération and Les Inrockuptibles all chose a similar illustration showing the governmental team aboard a pirogue. That selection was obviously based on an illustrative combination, the comical aspect of which comes from bringing together the mention of electoral failure and the perilous situation of the President and those close to him in the flimsy boat. Le Monde, « Nicolas Sarkozy évoque l’hypothèse de sa défaite », 25/01/2012. 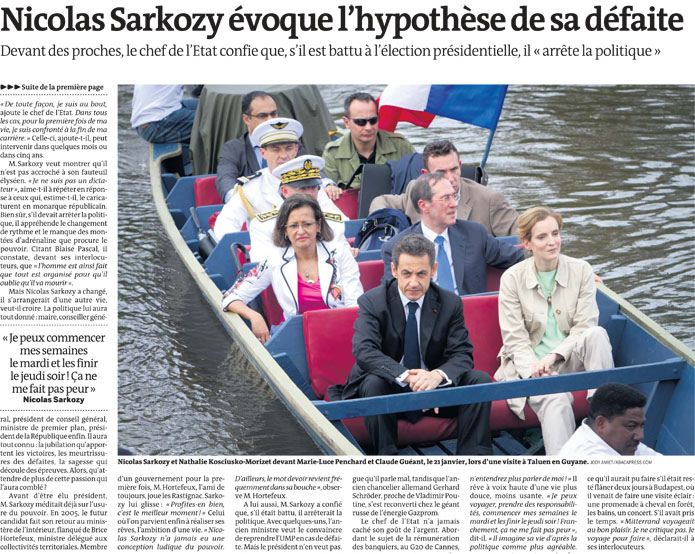 The head of Les Inrockuptibles’ photographic service admitted in private that she had chosen the same picture «because Sarkozy looks ridiculous, and because of the symbolism of the boat», but the answer of her counterpart at Le Monde is indicative of the unacknowledgeable nature of the allegorical cross-reference. In the editorial context of the daily newspaper, it is not possible, except in spaces specifically dedicated to caricature, to admit to humorous treatment of an important political news story. While the ambiguity of the picture allows editors to conjure up implicit connotations that steer interpretation concurrently with pretended innocence, it also permits them to play the game of the unsaid and to exonerate themselves on the grounds of the subjectivity of interpretation. Like jokes and allusions, images make it possible to say everything while claiming not to have said it – a typical mechanism of implicit messages, where understanding relies on the reinstatement by the recipient of the missing part19. Far from being the documentary ideal, iconic photographs provide an understandable and acceptable version of mediatic tragedies for the Western public. Rather than being images without captions, the finest examples of photojournalism are, strictly speaking, captions in image – visual stereotypes developed to facilitate comprehension of a meaning made obvious, at the risk of error or deliberate deceit. When the World Press Photo contest gave its 2007 award to Spencer Platt’s photograph depicting a group of Lebanese youngsters travelling through the ruins of Beirut in a red Mini Cooper, it was for the interpretation it spontaneously inspires of the voyeuristic drifting thought to characterize contemporary society. Unfortunately the story we read from this image has very little relationship to reality. Questioned by a Belgian newspaper, Jad, Bissan and Tamara Maroun, Noor Nasser and Liliane Nacouzi, the young people in the photograph, explained that they were not tourists out on a spree but in fact refugees, returning for the first time to observe the state of their neighbourhood, which had been devastated by Israeli bomb attacks20. Confronted with the powerful narrative constraints of journalism as a genre, professionals make wide use of the range of expressive visual resources, while maintaining the fiction of the decisive moment so dear to Cartier-Bresson. It is up to researchers not to blithely reproduce that mythology but to analyze the true conditions under which the visual story was produced. This analysis must be based on observations of ordinary cases in context rather than on a reduced sample of exceptional, decontextualized icons, and it must never lose sight of the various interactions of visual content with the other components of the mediatic system21. english, icône, journalisme, narration. Signet.